Last year I spent some quality time in the Colli Berici in northern Italy. These are the hills that rise out of the flat plains, between Vicenza and Verona. Here, in central Veneto, the Colli Berici was my countryside base for visits to these historic cities. As usual, the local DOC wines attracted my attention, and I vowed to return and find out more. In September 2017 I did just that. 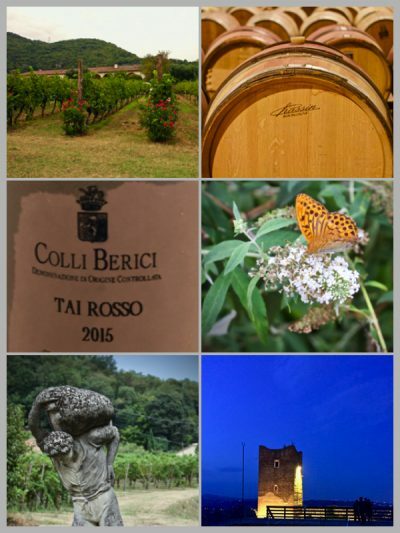 So this is my story about the lovely Colli Berici and its unique red grape, Tai Rosso. Tai makes authentic premium quality wine, yet neither this area or its unique grape are well known. In a region famous for Valpolicella, Amarone, Soave and Prosecco, welcome to the Veneto’s best-kept secret. Where and what are we? 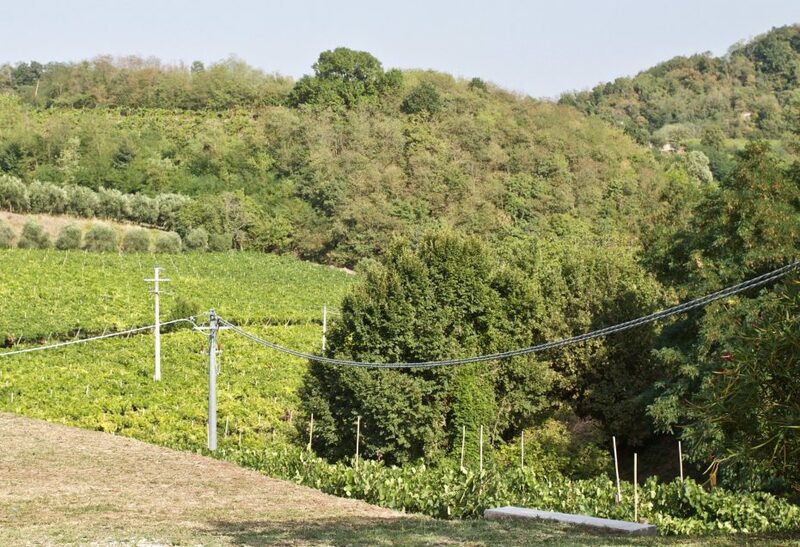 This Part 1 is about the Tai Rosso grape and the Colli Berici DOC region. Part 2 focuses on five producers of Tai Rosso. Tai Rosso is the Grenache Noir of France and Spain. It’s also the Cannonau of Sardinia. However, this grape has gone native in the Colli Berici. Indeed, it’s believed to have been here for hundreds of years. Grenache is commonplace around the world. Strangely, the Colli Berici is virtually the only place in northern Italy growing it. Why it’s here is a mystery. Some think that it arrived from Avignon in France, the home of Chateauneuf-du-Pape. The Cardinals of Vicenza supported and visited the Avignon Popes during the Papal Schism. Hence it’s possible that cuttings of the Grenache vines returned with them. Fact or fiction? It sounds plausible, but we may never know for sure. There is no doubt though that Tai Rosso has its own clear identity. It has bigger grape berries and thicker skins than Grenache in France or Spain. It seems to produce higher acidity, less sugar and has a paler colour. Correctly speaking, Tai Rosso is a biotype of Grenache Noir and Cannonau, meaning they are genetically identical. However, there’s been years of local adaptation in the Colli Berici. That means Tai Rosso has the same DNA but a different look and taste. To add further confusion, Tai Rosso was once known as Tocai Rosso. However, Hungary claimed global precedence for the name Tokaji. So in 2007, it was necessary for all other grapes called Tocai to change their names. Hence Tai references the old name and keeps a separate identity from Grenache, Cannonau or Alicante. 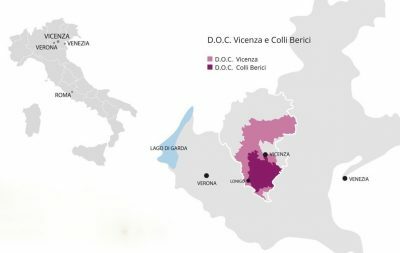 In 1973 the Colli Berici received DOC status. It’s well away from the pre-Alps to the north. 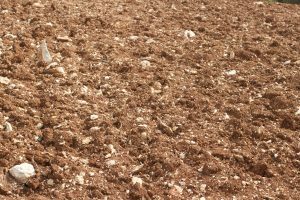 Hence this warm and mild terroir is different to any other in the Veneto. The local geology is an old limestone sea-bed. Around 60 million years ago, pressure from volcanic magma welling up under the limestone pushed these hills up. Geologists call that process Bradyseism. It also added basalt rocks into the mix. 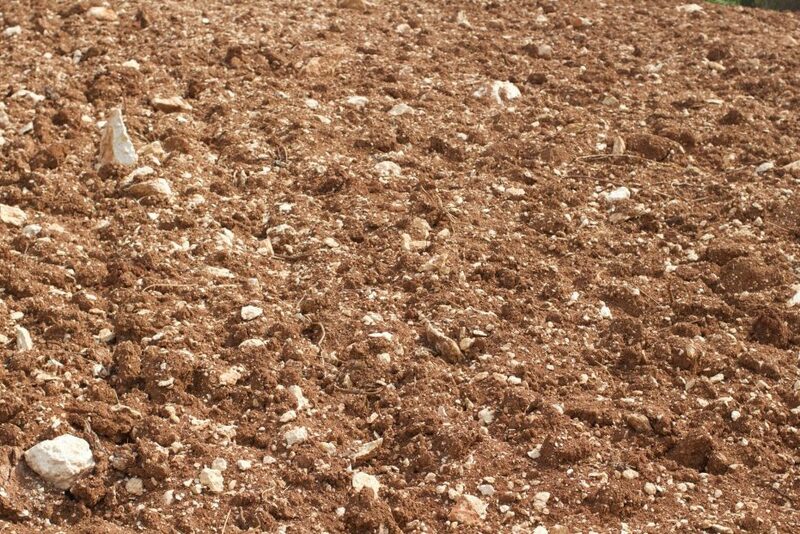 The hilly terrain has rich, red clay soils full of fossils, called Terra Rossa. The best vineyards are on free-draining and south-facing slopes. At an altitude of around 300 metres, they avoid the risks of frost and fog. Vines can get water-stress in summer. It’s particularly true this year, where a lack of rain and intense heat spikes have meant considerable challenges across Europe. Being Italy, Tai Rosso cultivation is either on traditional Pergola Veronese or “modern” Guyot systems. Unlike the Grenache in other countries, you won’t find it cultivated as a stand-alone bush vine. The vineyards tend to be small, family owned and interspersed with olive groves and natural woodland. Being near to Vicenza, magnificent Palladian Villas dot the Colli Berici landscape. These enhance the natural beauty of this rolling land. Within the Colli Berici DOC is an even tinier enclave, a sub-zone around the village of Barbarano. Blink, and you’ll miss it. It’s exclusively Tai Rosso land, and is perhaps where the first plantings were. Some Barbarano producers don’t use the Barbarano name as they consider the Tai Rosso name to be more memorable. From an international perspective, it’s a moot point. There are plenty of international and local grape varieties here. The internationals include Pinot Nero, Merlot, Cabernet Sauvignon, and Cabernet Franc/Carménère in red. Pinot Grigio, Pinot Bianco, Chardonnay and Sauvignon Blanc are the whites. Indeed, the DOC can boast that it was the first Italian DOC for Cabernet Franc in the whole of Italy! Local grapes include red Tai Rosso, but also white Tai Bianco (Friulano), Incrozio Manzoni and Garganega. This enormous variety means there is wine made here in every style imaginable. There is Charmat and Metodo Classico fizz, white, red and rosé wines, plus sweet passito and even Vin Santo. The potential for quality wine here, particularly in red wine, is enormous. 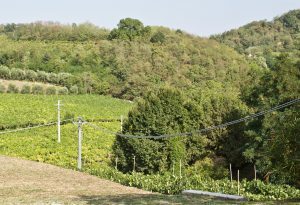 For example, famous Soave producer Inama expanded into red wine growing. They chose to locate in the Colli Berici rather than in Valpolicella. Those reds are superlative, especially their Carménère. By the way, their 12 ha Oratorio vineyard is the largest single Carménère vineyard in Europe. The DOC has only 830 hectares under vine (80 of which are Tai Rosso), with some 850 growers. This area remains a quiet place of mountains, rivers and forests. In 2016, those DOC vineyards made a total of 49,000 hectolitres of wine. 63% of it was red, primarily Merlot and Cabernet Sauvignon. Because of bulk wine sales via the large cooperatives, there were only 1.7 million bottles of DOC wine produced. Of this, just 350,000 bottles were Tai Rosso. Production of bottled Tai Rosso is therefore tiny. It’s only the equivalent of one smallish winery, so no wonder it isn’t better known! The variety of grapes and styles from such a small area means the DOC hasn’t yet established a clear identity. However, I think that despite the suitability of the Bordeaux red varieties, the USP of this place is Tai Rosso. It’s uniqueness, quality and versatility are hidden strengths. Tai Rosso is of this place, and virtually nowhere else. Tai Rosso is highly versatile. It can be a blending partner, a chilled light red resembling a Rosato (Rosso Chiaro? ), or make Charmat and Metodo Classico fizz. However, the best expression is as a Riserva. That’s a serious red, frequently maturing in oak barrels. Large old oak casks suit it perfectly; new barriques would drown it. Usually a light ruby red colour, Tai Rosso has a full aroma, typically of cherry, raspberry, red flowers and violets. In the mouth, there’s plenty of those fruit flavours and a herb character. There’s an aftertaste of almonds and notably, rose hips. A striking point is its acidity and moderate alcohol. That imparts a welcome freshness and elegance. It’s easy to make winery visits here. Start at Lonigo (where the headquarters of the Consorzio are) and follow the Colli Berici’s Strada dei Vini (wine road), created in 2001. It’s a lovely journey, with wineries, vineyards, Palladian Villas and small villages en route. Oh, and all this wine talk’s made me hungry! Nothing better to go with a glass or two of Tai Rosso than with the local cold cuts; Sopressa Vicentina DOP and Prosciutto Veneto Berico-Euganeo DOP. Oh, and don’t forget Olives and the Grano Padano and Asiago cheese. Meanwhile, Part 2 features five producers making excellent Tai Rosso wines in the Colli Berici DOC. This article was written for International Grenache Day 2017, a celebration promoted by the deeply groovy Grenache Association, of which I am a member. I moved to Padova some years ago and met the neighbouring Colli Euganei area, rich of history, villas and gorgeous wines that grow fast… Specially but not only the red Bordeaux style “Rosso Colli”, made by a blend of merlot and cabernets. Very interesting whites are the dry or sparkling sweet moscatos (Fiori d’arancio) and others… hundreds of small producers make the local scene and some of them, as for instance Vignalta are already well-known and appreciated all over Italy and even at some international spots. Since Colli Euganei lay at about 20kms from colli Berici, I suppose you visited the area… If not, it would be an honour to show you something at your next trip to our beloved region!